Well almost—4 more rows till the miter is finished. Then straight up the back and the main body of the work is done. Good thing too, because I am using the last big (full skein or nearly so) balls of yarn. 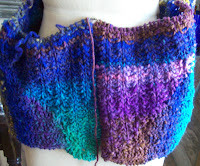 I have 2 mini balls for the front bands-- and what ever is left over from the back will become the collar. I cast on for a hat last night—and have about 1 inch of ribbing.. which is nice progress—its a fine yarn (sports weight) and size 5 (3.75mm) needles—not my more usual worsted/size 7 or 8. 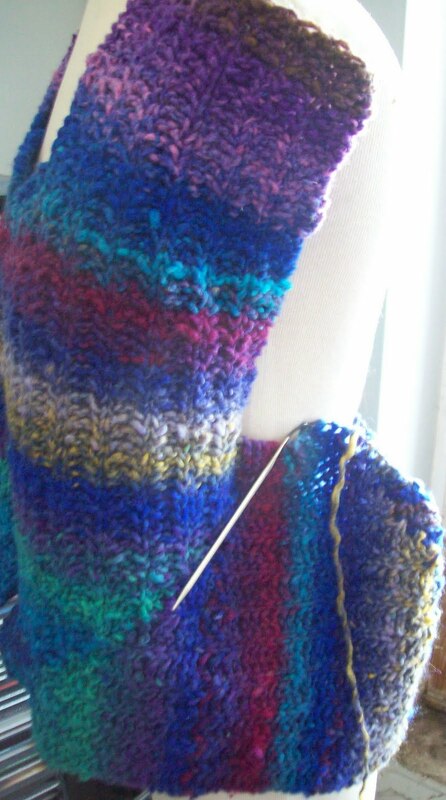 So a quick photo—and back to knitting—and cleaning. I tend to buy 'bargain/family' packs of meat--(they are cheaper) and then to cook up a storm--(this week? Sauted chicken (cook and frozen) Curried Chicken 2-kinds/recipes--(cook and frozen) Chicken Soup (cooked and frozen)--I like chicken—and it was on sale–But I also cooked up some Italian sausages--(so its not all chicken, only chicken!) and now I have a sink full of pots to wash! My daughter has become a dedicated Locavore--and given up, largerly, her favorite fruit—Bananas. Yesterday, I was at the green grocers stocking up on depleted veggies --No onions! (I can't function with out onions!) And a nice big cabbage—a favorite winter green, and a cauliflower (roast cauliflower will go so well with curried chicken! ), and peppers---got to have some greens to go with all that meat! 1 of the half dozen (they were small) haas avacacos is already gone—eaten last night as a gaucamole (a some what hot and spicy one made with a generous portion of crushed dried chipoltas)—which is so much better than tartar sauce with “fried” fish (Mrs.Pauls—oven baked not fried, filets).--and besides, I don't like tartar sauce! Luckily—I had cooked up all the chichen—because the green chili's and tomillos tried to convince me to make a white chili—and I already had avacodos. For the next few weeks, dinners will be heat and serve—unless I am feeling creative. With onions, potatoes and peppers on hand—I can always cook up a frittia—eggs were on sale too, and I have 2 dozen to work my way through.